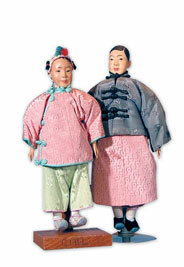 The story of the Effanbee Doll Co. and its founders, Bernard Fleischaker and Hugo Baum, is quite a success story. They were not dollmakers, just businessmen taking a risk. Much of their positive outcome can be attributed to research and new ideas. They studied the market, found what was popular and then added their own creations. 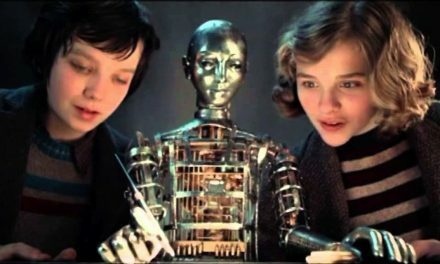 One of their most popular “inventions” was their “Dy-Dee” doll. The darling was introduced in 1933, and the first examples had rubber bodies and rubberized composition heads. The doll could be fed through her open mouth. Tubing ran from the mouth to her buttocks where a plug allowed her to wet on demand. Controversial? Of course, it was. Some adults described the doll as offensive, but many admired the realistic baby. 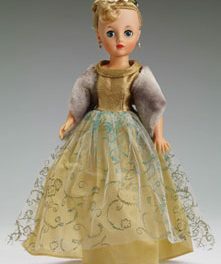 She became one of the best-selling dolls ever and played a major role in the Effanbee Doll Co.’s success. 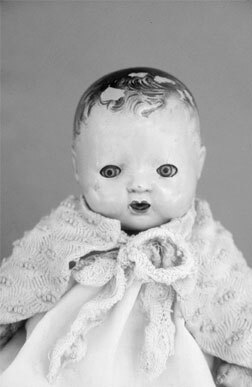 The doll was offered for sale through the Montgomery Ward catalogs as well as retail stores. They literally sold by the truckloads. Every little “mama” in the land wanted one. The early dolls had molded hair and molded ears, but by 1940 Effanbee added applied rubber ears. These are quite distinctive, making Dy-Dee dolls easy to spot and identify. Molded hair could still be found, but by the ’40s some models had lamb’s curly wool wigs. Competition among manufacturers continued to bring changes. The Dy-Dee bodies were updated and made of longer lasting materials. The early rubber bodies are very hard to find; many of them melted or disintegrated through time. The very early heads have no markings, and collectors often don’t recognize them. Other innovations include dolls that would cry when a pacifier was inserted in their mouths, and a bubble pipe in some of the special layette sets allowed blowing bubbles with the squeeze of a tummy. Of all the drink-and-wet dolls, Dy-Dee had the most accessories available for separate purchase. There was clothing of all types. There was a deluxe bathinette featured in the 1946 Effanbee catalog. 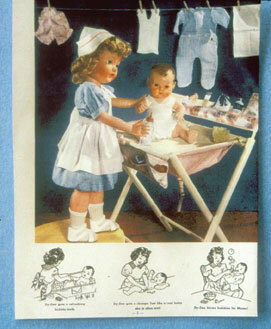 There was also a diaper can complete with clothesline, clothes­pins and soap for dirty laundry. As special as Dy-Dee dolls were, American Character Co.’s Tiny Tears became more popular during the 1950s. Although no longer the most sought-after drink-and-wet baby, Dy-Dee continued in the Effanbee line throughout the 1960s and into the 1970s. In 1984 Effanbee honored the Dy-Dee doll with a 50th anniversary commemorative edition. Collectors could pick from two models, both made in vinyl and dressed in the famous Dy-Dee basic outfits. One version had the old caracul-type hair and the other’s hair was molded. The limited editions were introduced during the summer and available until October 31. In 2002 Robert Tonner of Tonner Doll Co. purchased Effanbee Doll Co. and has since reproduced some of the popular vintage dolls that made Effanbee one of America’s longest success stories. Once again there were Dy-Dee dolls on the market. “Dy-Dee Baby Holiday Sweetie” came in time for Christmas 2005 and a limited edition of 500 “Dy-Dee Babies” with layettes was available in 2006. The Internet has helped with the search for Dy-Dee, whether looking for vintage or new. She is not hard to find. Don’t forget to look for Dy-Dee extras such as books, clothes, bubble pipes, trunks, paper dolls and sewing patterns.